A protestor holds an "Occupy the Hood' sign in New York City. The Occupy protests against corporate greed have brought together a broad coalition of people, but there have been questions about whether the crowds assembled are racially representative. 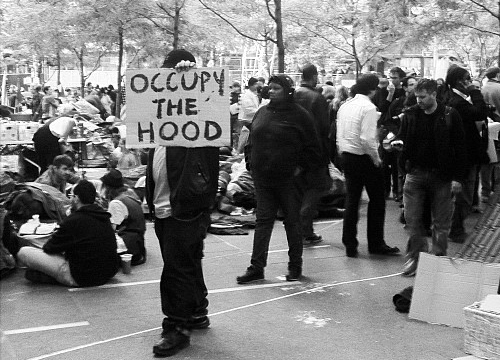 Enter Occupy the Hood, a sub-movement that started in New York and Detroit and is now spreading to other cities, including D.C. The goal is to get more people of color involved in Occupy protests and ensure their voices are heard. Friends Julian Liser, 21, and Drew Franklin, 24, started the D.C. branch last week. They say the protests in D.C., where 61 percent of the population is non-white, should be attracting more people of color, particularly from economically depressed communities since they are hardest-hit by the economic woes at the center of the movement. Liser’s story is similar to many of the white protestors on K Street. He’s unemployed and was motivated to join Occupy DC after learning about the new Bank of America debit card fees. Such fees are “killing my account,” Liser says. There have been some efforts aimed at improving the racial diversity of the protests. Anti-racism training has begun at Occupy DC, for example, which focuses on raising awareness about white privilege. Franklin and Liser, who say the D.C. protests are generally welcoming to people of color, want to hold meetings throughout the city and involve organizations based in marginalized communities. Occupy DC has endorsed their efforts. Some say it’s divisive to focus on race in the Occupy movement, which is largely about class issues. Let’s not forget that people of color have been organizing for economic justice in DC for quite a long time now. The media, however, was not quite as interested in their efforts. As a white participant in Occupy DC, I realize that we are not doing something new – we are following in the path that people of color have laid out for us. Thanks for contributing that comment!